Very nice and beautiful pork belly, roast until skin is crispy, crunchy and aromatic. But the meat is juicy, soft and sweet. It is really good to serve the roast pork with chili sauce. 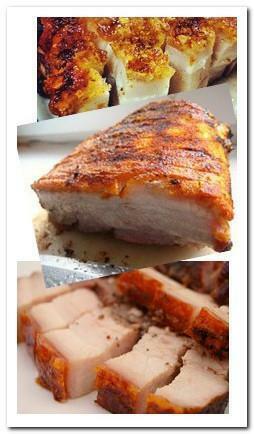 Chinese roast pork, sounds a big task to make it at home. This is an easy recipe, only a few ingredients and very little preparation work, roast in oven. The final outcome is amazing. Make 6 horizontal slits approximately 1 inch deep at the side of the pork belly. Stuff the garlic into the slits and push them deep, so the garlic won't slip out during the roasting process. Place pork belly skin side down on a tray, rub rice wine, five spice powder, white pepper and brown sugar on the fresh side (meat side) thoroughly and evenly. Leave it in the fridge for 2 hours or overnight, skin side up. Take out the pork belly from the fridge before baking, let it come to room temperature. Meanwhile, pat dry pork belly skin with paper towel. Place on a wire rack. Spread salt over the skin evenly until the skin is totally covered with salt. Place the belly at the top half of the oven, and place a baking pan with around 1 inch water at the bottom half of the oven. The pork belly is baking above water, and check the water level regularly. Top up the water if needed. Bake for about 1 hour until the salt turn into crust. Remove pork belly from oven, discard the salt crust. Increase the oven to 240°C, bake for 40 minutes or until the skin turn golden color and crisp. Take the roasted pork belly out of the oven and rest for 10 minutes, cut and serve with chili sauce.